It's almost the end of the year for us, and kids are starting to think about how hard it is to say goodbye to favorite teachers. 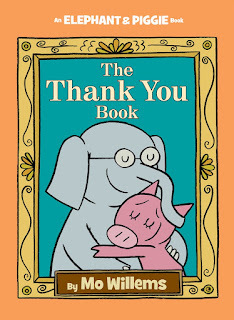 I wish I could give every teacher a copy of The Thank You Book, Mo Willem's terrific finale for his Elephant and Piggie series. 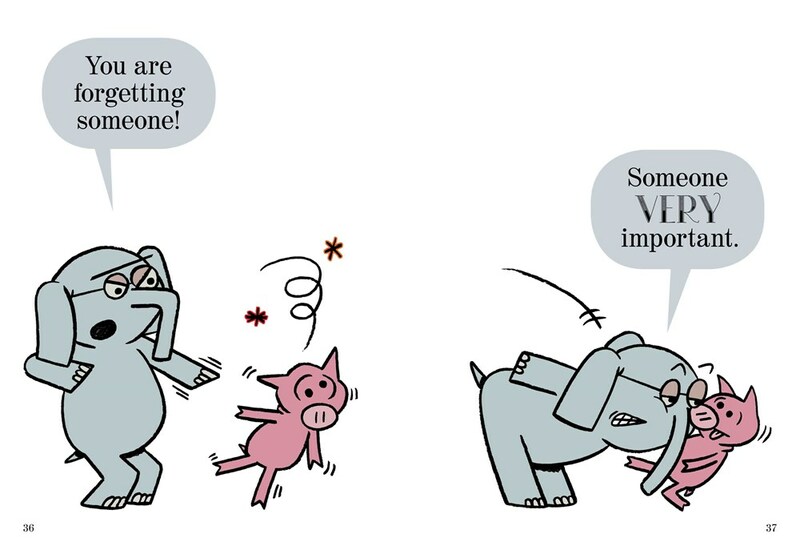 This is a must-read series; kids of all ages love the friendship and banter between Elephant and Piggie, especially 1st graders who are venturing into reading independently. Gerald and Piggie are best friends. They help each other, they play with each other, and they give each other advice--plenty of it. Piggie is outgoing, and Gerald is cautious. Piggie tends to be head-strong, while Gerald tends to be a worrier. This combination creates plenty of laughs, and it lets kids see different sides of their own personalities. "This series has transformed many a little reader. It has given the gift of expression, confidence, laughter and fun. And it ends with gratitude." Gerald and Piggie have starred in twenty five books(!!) together. For their finale, Piggie decides to thank everyone. She's so happy, that she's thanking of all her friends, "everyone who is important to me." But Gerald is worried that she might forget someone...someone very important. "Thank you all for being great friends!" Willems creates tension with ease, as Gerald gets more and more upset. 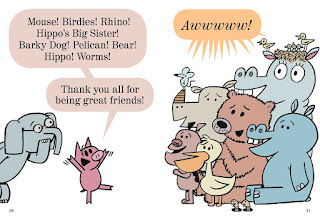 Readers are just sure that he wants Piggie to thank HIM, but Willems pulls out the perfect surprise ending. "You are forgetting someone! Someone VERY important." In a delightful twist, Gerald turns to Piggie and reminds her that they need to thank their readers. “We could not be ‘us’ without you,” says Gerald. Piggie joins in, adding, “You are the best!” Talk about a moment that melts my heart, each and every time I read it. Willems honors the hard work that young readers do in bringing stories to life, and he does so with joy, humor and heart. As a teacher and a librarian, I want to thank every child who's shared their reading lives with me, every parent who's entrusted their child to me, every author who's shared a bit of themselves with us through their words. 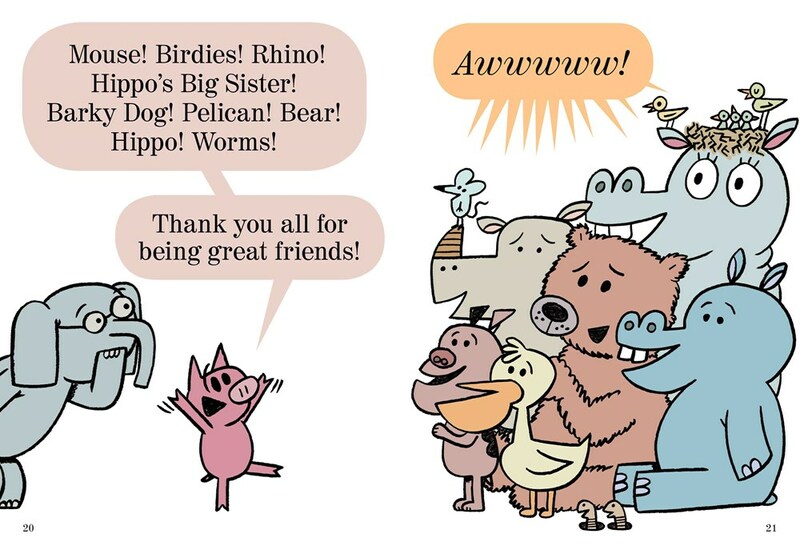 Thank YOU, Mo Willems, for bringing so much joy to all of us, helping us create so many teachable moments, so many wonderful conversations. Head on over to ThankoRama.com to download, print, and fill out your own #ThankoRama speech bubbles. 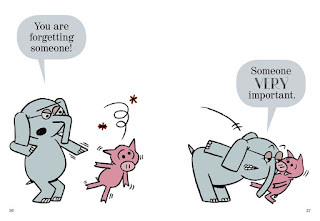 Teachers, definitely check out The World of Elephant and Piggie Teaching Guide. Thank you, my blog readers, for sharing the joy of reading with me and with all the kids in your lives! The review copy was kindly sent by the publisher, Disney-Hyperion. If you make a purchase using the Amazon links on this site, a small portion goes to Great Kid Books. Thank you for your support. 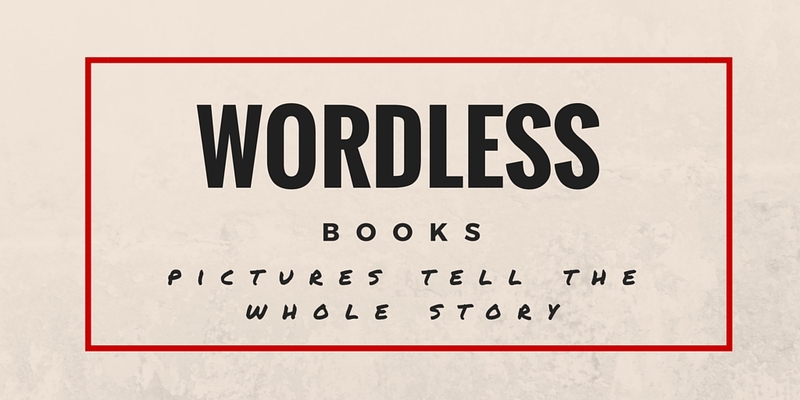 Do you enjoy reading wordless books with your child? Do you like the freedom to make up your words and stories, or does it leave you a little lost? Wordless picture books tell the stories only through the illustrations, and they put much more of the storytelling role onto the reader. 1. Encourage children to make up the story. There is no "right" or "wrong" way to read these books. 2. Spend time looking at the cover and talking about the book's title. What do you think this story is going to be about? What do you notice? 3. Take a "picture walk" through the pages, looking at the pictures and talking together about what you see. 4. Slow down and notice the details together. Talk about the characters' expressions, the setting, the use of color. What does the illustrator want us to notice? 5. Encourage your child to use different voices, add sound effects and use interesting words as they tell the story. Have fun! These conversations will enrich your child's storytelling, bringing joy and meaning to the experience. 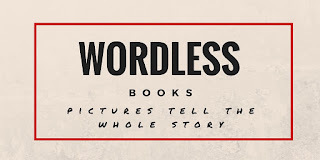 Here is a collection of my favorite wordless books, new and old, with a brief description (based on the publisher's description). 10 Minutes till Bedtime, by Peggy Rathmann -- A boy's hamster leads an increasingly large group of hamsters on a tour of the boy's house, while his father counts down the minutes to bedtime. A Ball for Daisy, by Chris Raschka -- A dog has fun with her ball, until it is lost. This story is about what it is like to lose something special, and find a friend. Draw!, by Raúl Colón -- A boy who is confined to his room fills his sketch pad with lions and elephants, then imagines himself on a safari. The Farmer and the Clown, by Marla Frazee -- A farmer rescues a baby clown who has bounced off the circus train, and takes very good care of him until he can reunite the tot with his clown family. Flora and the Flamingo, by Molly Idle -- In this wordless book with interactive flaps, a friendship develops between a girl named Flora and a graceful flamingo, as they learn to dance together. Float, by Daniel Miyares -- A boy loses his paper boat in the rain, and goes on an adventure to retrieve it. Good Night, Gorilla, by Peggy Rathmann -- An unobservant zookeeper is followed home by all the animals he thinks he has left behind in the zoo. Journey, by Aaron Becker -- A lonely girl draws a magic door on her bedroom wall and through it escapes into a world where she creates a boat, a balloon, and a flying carpet that carry her on a spectacular journey. The Lion and the Mouse, by Jerry Pinkney -- In this wordless retelling of an Aesop fable set in the African Serengeti, an adventuresome mouse proves that even small creatures are capable of great deeds when she rescues the King of the Jungle. Mr. Wuffles!, by David Wiesner -- Mr. Wuffles ignores all his cat toys but one, which turns out to be a spaceship piloted by small green aliens. Pool, by JiHyeon Lee -- Two shy children meet at a noisy pool and dive beneath the crowd into a magical undersea land, where they explore a fantastical landscape and meet various creatures. Spot the Cat, by Henry Cole -- A cat named Spot ventures out an open window and through a city on a journey, while his owner (and the reader!) try to find him. Tall, by Jez Alborough -- All the jungle animals help a very little monkey to feel that he is tall. The Typewriter, by Bill Thomson -- Three children find a typewriter on a carousel, and begin an adventure that helps them discover the wonder of words. Many of my students are drawn to realistic fiction because it gives them a chance to immerse themselves in someone else's story. In fact, a recent study has shown that reading literary fiction helps improve readers' ability to understand what others are thinking and feeling (see this article in Scientific American). 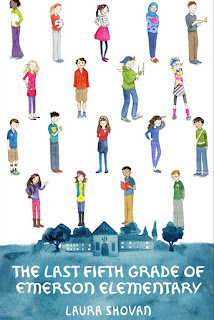 Laura Shovan's novel in verse, The Last Fifth Grade of Emerson Elementary, is full of distinct voices that prompt us to think about different students' unique perspectives. It's one my students are enthusiastically recommending to one another. Eighteen fifth graders keep poetry notebooks chronicling their year, letting readers peak into their thoughts, hopes and worries as the year progresses. Fifth grade is a momentous year for many students, as the finish elementary school and look ahead to all the changes that middle school brings. This year is particularly full of impending change for Ms. Hill's class because their school will be demolished at the end of the year to make way for a new supermarket. Through these short poems, Shovan captures the distinct, unique voices of each student. The class is diverse in many ways--racially, ethnically, economically, and more. At first, I wondered if I would really get to know the different students since each page focused on a different child; however, as the story developed, I really did get a sense of each individual as well as the class as a whole. Shovan creates eighteen distinctive individuals--with personalities and backgrounds that we can relate to and envision. And these experiences shape how each individual reacts to the year. I particularly love novels in verse because they allow readers a chance to see inside character's thoughts without bogging the narrative down in too much description. As researcher David Kidd said (in this Scientific American article), literary fiction prompts readers to think about characters: "we’re forced to fill in the gaps to understand their intentions and motivations.” This is exactly what ends up being the strength of Laura Shovan's novel. The funniest thing, for me personally, has been the shocked look of many of my students when I show them this cover. You see, our school is called Emerson Elementary School. "This is a real book?!?!" they say, incredulously. I know my students will particularly like the way these students protest the plans to demolish their school, bringing their protest to the school board. As you can see in this preview on Google Books, this collection of poems slowly builds so readers get a sense of each student in Ms. Hill's fifth grade. The poetry feels authentic, never outshining what a fifth grader might write but always revealing what a fifth grader might really be thinking. I highly recommend the audiobook for The Last Fifth Grade of Emerson Elementary. The diverse cast of Recorded Books brings alive each character. This would make a great summer listen, or a great read-aloud for the beginning of the school year. The review copy for the audiobook was purchased from Audible and for the print copy it was borrowed from my local library. If you make a purchase using the Amazon links on this site, a small portion goes to Great Kid Books. Thank you for your support. My students love sharing fairy tales and they have so much fun reading new twists on old favorites. 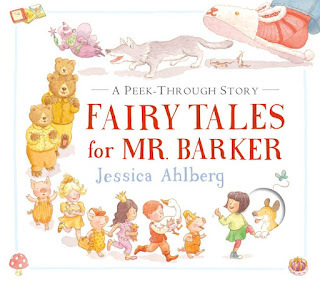 Two new favorites emphasize humor and downplay the traditional tales' darker sides, making them perfect for preschoolers and kindergartners. With charming rhymes, Underwood creates a scene where fairytale villains come together at the end of a long day to share dinner and bedtime stories. The baddies really shine when given a chance. no one throwing food or whining. now, at night, they chat and smile. 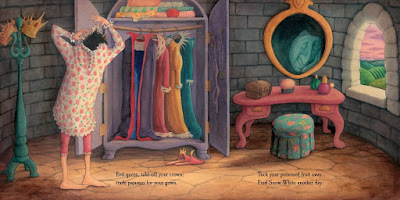 The evil queen puts on pajamas, while the wolves brush their teeth (well, their fangs). The sweet rhymes and soft illustrations contrast perfectly with baddies' reputation--who would think that the troll enjoys a bubble bath after a hard day waiting for the three billy goats gruff? trade pajamas for your gown. Tuck your poisoned fruit away. Find Snow White another day." Children will enjoy recognizing favorite tales and spotting details from each in the illustrations. 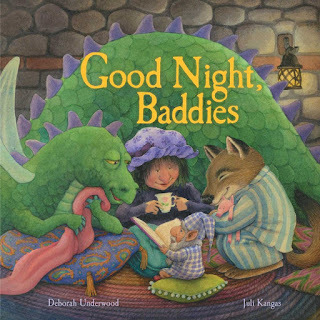 I absolutely agree with the BookDragon's review: "Deborah Underwood and Juli Kangas are a delightfully subversive team, proving even the meanest baddies need time to relax and recharge." Young Lucy chases her dog through fairy tale lands, dodging bad guys along the way. Even before you get to the title page, young Lucy asks her dog, "Do you want to hear a story, Mr. Barker?" But the pup is distracted by a butterfly, and takes off out of the open window. When Lucy follows him, she enters one new fairytale world after another -- and readers must guess (along with Lucy) where she is. "Where are we?" asked Lucy. She saw a broken chair, three bowls of porridge, and a little golden-haired girl." Just as the villain enters the scene, Lucy knows that it's time to leave and invites her new friends to join her. Soon she's followed by Goldilocks, the three little pigs and Jack, with the three bears, the wolf and the giant all chasing them. Ahlberg uses the cutouts very effectively, engaging young readers and prompting them to wonder what's on the other side. It is interesting that both books draw only from European folktales and fairytales. The illustrations show mainly white characters, although Ahlberg draws both Lucy and Sleeping Beauty with brown hair and slightly darker skin tones. The review copies were kindly sent by the publishers, Time, Inc. (via BlueSlip Media) and Capstone Books. If you make a purchase using the Amazon links on this site, a small portion goes to Great Kid Books. Thank you for your support. Baseball season is in full swing. The weather has been fabulous for baseball viewing. 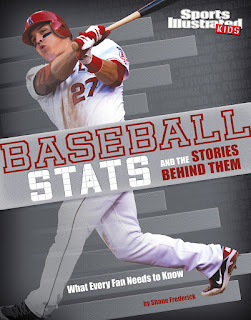 Share these new books with kids who love baseball stats, stories and players. Whether it’s looking at changes in equipment or comparing playing styles then and now, this high-interest book provides opportunities for fans to analyze different aspects of the game. Emerson 4th and 5th graders are loving this book. Here's one student's favorite page -- showing the way baseball gloves developed from the 1880s to present day. Great layout, photographs and illustrations engage kids and help them see the progression of the game over the past 150 years. The information is detailed, but broken into short chunks that kids can absorb. Excellent photographs will draw kids in, but it's really the text that will keep them coming back for more. Even die-hard fans will learn new aspects of the game's history, equipment and players. 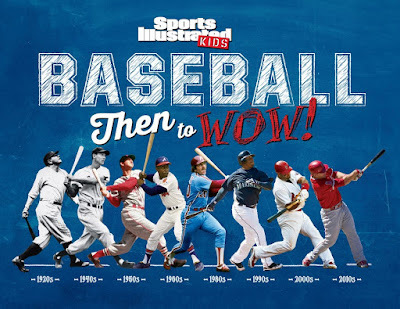 Check out this full review by my friend Brenda Kahn over at Prose & Kahn to read more about this new Sports Illustrated baseball book. She calls it "a fine addition to any collection. The clean layout provides an organized, humorous journey for the eyes." Baseball fans love comparing stats to get a handle on how their favorite teams and players are doing. Braun introduces kids to the math behind the stats with this clear, high-interest introduction covering everything from basic batting averages to slugging and fielding percentages. Full of up-to-date stats and photos. Look through this preview on Google Books to get a sense of the math and text -- I think this will be right for 4th and 5th graders, although some younger students will definitely enjoy reading this, perhaps with more parent support. Examples are current, up-to-date stats. I especially like how the text explains both the math and the significance of the stats. Braun really captures the excitement of the game, and the way that stats help fans compare players. If you're looking for a baseball math book for younger fans, you might check out The Math of Baseball, by Ian Mahaney. I love traveling, going to see new places and experience new things. But traveling with kids, well that takes a special sort of patience, humor and--above all else--preparation. 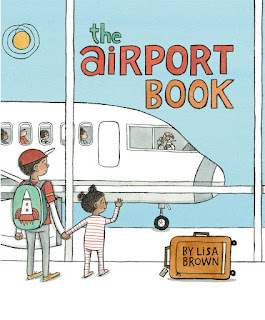 I adore, adore, adore Lisa Brown's newest picture book, The Airport Book, precisely because she celebrates the adventure of traveling by airplane with kids, full of so many things to look at and so many stories within the main story. "Don't forget monkey!" a mom reminds her family, as they are finishing their packing. "Of course I won't forget monkey!" the dad replies, and kids will smile as the little girl announces proudly, "I pack monkey!" 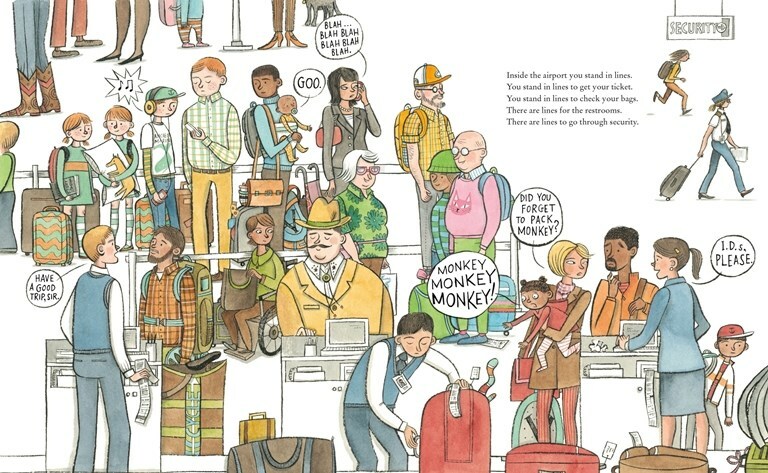 Right from the beginning, Brown engages readers with the story, encouraging readers to predict just what's going to happen when monkey goes missing. "Did you forget to pack monkey?" Young readers will start by following the toddler's cry for her beloved monkey. With an adult or older reader, they will then read the cool, composed voice explaining the experience. I like to think of this as the big brother coaching the little sister through the experience. "Inside the airport you stand in lines. You stand in lines to get your ticket. you stand in lines to check your bags. There are lines for the restrooms. There are lines to go through security." Linger on the page for a while, and you'll notice that there are all sorts of little stories within the central story. Readers will have a great time choosing a character and seeing what's happening to them in the next scene. "You squeeze into your seat. Some bags go up top. Some bags go underneath." 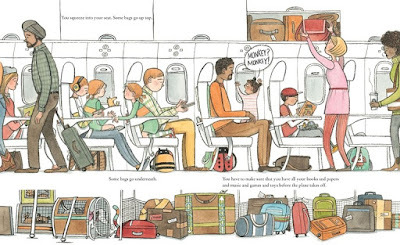 Brown captures the busy nature of airplane travel without leaving the reader overwhelmed. Part of this is the reassuring, matter-of-fact tone of the main narrator and of the parents on the journey. Partly it's the satisfying story arc, both for the main character and the smaller stories. She balances detailed illustrations with a few large, open spreads of the airplane flying in blue sky. I especially love how diverse Brown's airplane travelers are--in so many ways. The main family is multiracial, with a black dad, white mom, two brown kids. There are people of different ethnic and racial groups. There is a working mom, constantly on her cell phone. A dad is traveling alone with a little baby. A woman is traveling independently in a wheelchair. And yet none of this diversity draws attention to itself--it seems effortless and natural, and yet Brown carefully, thoughtfully includes in so many ways. School Library Journal, starred: "A must-buy for most libraries." The Horn Book, starred: "Sky-high in concept, execution, and kid appeal; the only airport book you’ll ever need." Kirkus Reviews, starred: "It eases readers through these experiences, reassuring them with clarity, candor, and repeated words...this travelogue delivers at many altitudes." Illustration copyright © Lisa Brown, 2016, shared with permission of the publisher. The review copies were kindly sent by the publisher, Roaring Brook / Macmillan. If you make a purchase using the Amazon links on this site, a small portion goes to Great Kid Books. Thank you for your support. Local artist and author Lisa Brown has a deep and abiding love for picture books. Her newest book The Airport Book comes out tomorrow and is one of the best books of 2015! Brown not only writes and illustrates books, she also teaches illustration at the California College of the Arts. Last year, we had the BEST author visit at our school with Lisa (read all about it here). I spent a lovely afternoon talking with Brown about the power of picture books and sharing stories with children. This interview was originally published at Parents Press in March 2016. My words are in italics, Lisa's follow. I’m fascinated by the experience that reading a picture books leads to, especially between parent and child. What do you see as exciting and unique to this experience? 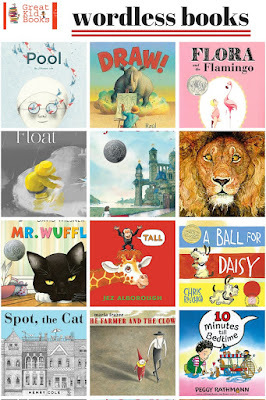 When I talk with people about picture books, I always say how there are two texts going on: the visuals and the words. A child on your lap is looking and reading the pictures while you are reading the text. There’s an interaction and an interactivity that happens because you can point things out to the child and the child can point things out as well. Oh, that's so true! And it's one of the reasons why children have loved reading The Airport Book with me, lingering over each page. With young kids, I start by pointing things out -- but then they jump right in. Older kids start talking and pointing things out right away! How do you encourage parents to bring picture books alive for young children when they read them aloud? It’s funny--there are books I read today that I only hear my father’s voice or my grandmother’s voice reading aloud. I hear my father reading “The Monster at the End of This Book” by Jon Stone. He would read it literally--when Grover was covering the pages with bricks, my father would struggle lifting and turning the page and I loved the drama he brought to it. Illustrators and authors create a moment to pause and linger with a page turn, a moment to anticipate what comes next. My father was reinforcing the art and the pictures as he read this story, and the whole story became real. As you turn the page, do you just start reading with a child? Yes, but… you stop often and ask questions. What do you see? What do you think the characters are doing? Why do they want to do that? Have a dialog with the pictures and with the child. In a good picture book, the text is not going to tell you everything. The pictures ideally carry half of the weight of the story. An adult should let the child read the pictures and talk about the story. Do you think about the age of your audience as you create books? Not really. Picture books are meant to be read with an adult and they work on many levels. I can create a story about Egyptology (which is sophisticated) and mummies (which are dead things!) and make it for children because they will have an adult reading it with them. 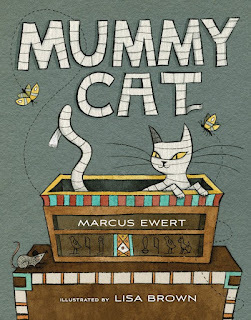 Yes, my students love Mummy Cat! And it also appeals to older children who want to figure out the puzzle on their own. So many older children I know still enjoy picture books. I hope parents encourage that with children and don’t push them to leave picture books aside as their reading develops. I tell my art students that a picture book is a piece of mass produced fine art : in most cases it is the only exposure a child will have to fine art. But it’s exposure that’s frequent and intimate, as opposed to a museum. Repetition is important. I think it brings comfort. I think it brings mastery, noticing more details each time children interact. Which book did your son ask for again and again? He loved Richard Scarry’s Best Storybook Ever so much when he was little that we had to hide it because it became so boring for us to read as parents. So we saved it to dole out in airports when we really needed him to be quiet and engrossed. 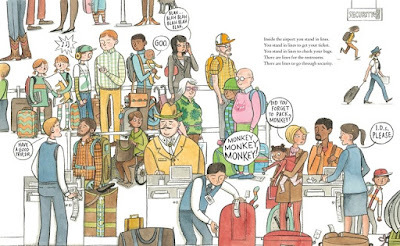 That’s so funny--The Airport Book reminds me so much of the wonderful detail in Richard Scarry’s books. It’s like this is coming full circle! Thank you so much, Lisa, for a lovely afternoon. I can't wait to share The Airport Book with everyone! Many thanks to the publisher, Roaring Brook / Macmillan for sharing the review copy and supporting our work here. If you make a purchase using the Amazon links on this site, a small portion goes to Great Kid Books. Thank you for your support. 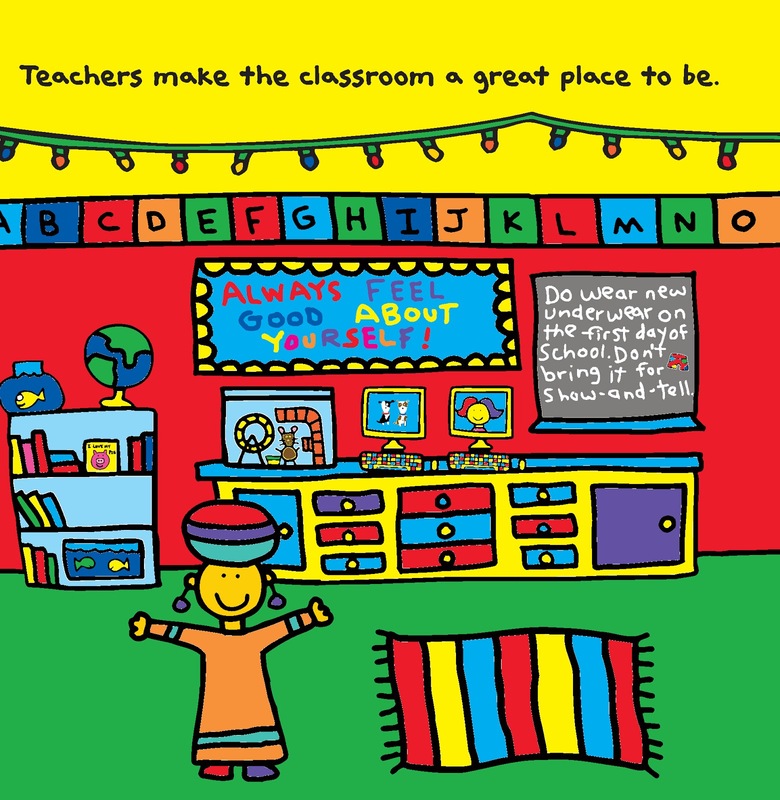 Todd Parr's books are a constant favorite at our school library. Todd celebrates all kinds of kids, all kinds of families. He makes us feel good with his positive messages and bright artwork. 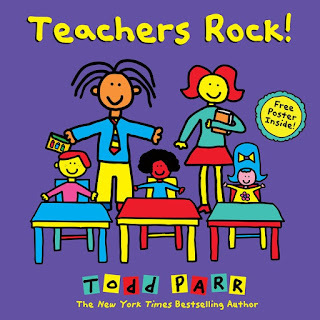 If you've liked his other picture books, you're going to love Todd's newest book: Teachers Rock! With simple text and playful illustrations, Todd Parr celebrates teachers for the love, enthusiasm and encouragement they bring their students each and every day. By looking at everyday activities, Todd calls out so many of the ways that teachers impact their students.He's goofy and makes kids laugh, and he helps us laugh at how silly we all are. And he's also absolutely sincere and genuine, sharing this love and appreciation with all students and teachers. 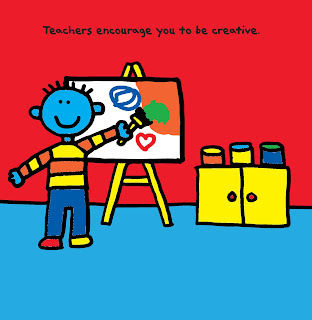 "Teachers encourage you to be creative." I'd love to welcome Todd to share a little bit about his creative process with us and what inspired him to write this story. 1. Who was a special teacher for you? How did she/he inspire you? I’ll never forget Miss Dona, my second second-grade teacher (yes, I had to repeat the second grade). She helped me learn to read. She challenged me to stand up in front of the class and speak. She taught me how to tell my left hand from my right. She took my marbles (the kind you played with and traded) so I wouldn’t get distracted. She even taught me how to make butter. 2. You're so enthusiastic and supportive! How do you keep this positive spirit? I look at life as it’s for living. Not for just getting by. I’m pretty much like everyone else. I have bad days too. 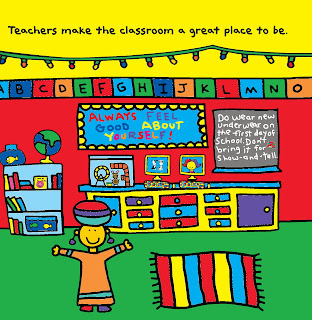 "Teachers make the classroom a great place to be." 3. The writing process can be so hard for kids. Can you share a picture of messy first draft, so they see a bit of your process? Since I do everything on the computer now. I can correct my mistakes instantly. It’s on of the reason I love working this way. I have a short attention span and want to see things come together instantly. 4. How do you get into a place or mindset for writing your poetry? Do you have any habits you could share with young writers? I write and draw when I am feeling excited and creative about something. There are no rules with me. Don’t force things. I love the way Todd talks about wanting to correct his mistakes and move on quickly. I think many of our 3rd graders would absolutely agree that this has been one of the best things about learning to use the computer for their writing. I'm going to keep this short. Enjoy celebrating the teachers in your life. Take time this week (and always) to tell them how much you appreciate them. Many thanks to Todd for making time to share his thoughts with us. Many thanks to the publisher, Little Brown for sharing the review copy and supporting our work here. If you make a purchase using the Amazon links on this site, a small portion goes to Great Kid Books. Thank you for your support. Occasionally I read a story that makes me yearn to reach back through time and hand it to the 11 year old me that loved nothing more than hiding out behind the couch lost in a favorite book. 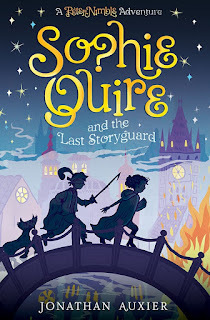 Sophie Quire and the Last Storyguard has me thinking about just what I liked reading when I was a kid. I loved reading fantasies that took me to far off worlds, showed me protagonists who battled great forces of evil, and triumphed using both brains and courage. I also loved fantasies that made me think just a little more deeply about our own world. Sophie is a girl after my own heart--a steadfast friend, willing to stand up for what she believes in. Above all else, she loves books and the stories they hold. Sophie works as a bookmender in her father's shop, caring for old books, helping to make sure they can share their stories with more of the town's citizens. But the town is turning on Sophie and her father: the Inquisitor is leading a movement to banish all nonsense from their town, and calling for all citizens to bring their storybooks to the great Pyre to be burned. Sophie is thrust into the role of protecting the magical Book of Who when Peter Nimble rescues her from arrest by Inquisitor Prigg and presents her with this amazing book. Sophie's mother died protecting the Book of Who, and now Sophie must protect it from Inquisitor Prigg's prying grasp. She is joined by Peter and his trusty companion Sir Tode, as they uncover the mystery of the books of the Four Questions: Who, What, Where and When. While this new book is definitely a companion to Auxier's Peter Nimble and His Fantasic Eyes (my review here), Sophie Quire stands alone very well--Auxier tells her own story, and Peter plays a supporting role. Children who love escaping into an adventure will definitely enjoy this--think of fans of Adam Gidwitz's Grimm series, or Rick Riordan's Percy Jackson series. I especially love how Auxier's characters are layered and developed, letting these characters live on in my mind. Good is tainted by hubris, greed or fear. Evil has roots in old wounds and competition. You have to understand someone's backstory to see where they're coming from. Even stories themselves can come alive in the hands of the right reader. I want to end by sharing a bit of an interview Auxier did over at Word Spelunking with Aeicha. If you enjoy this, definitely read the whole interview. What three words best describe your book, Sophie Quire and the Last Storyguard? Can you give us your best one sentence pitch to convince young readers, especially reluctant readers, to give Sophie Quire and the Last Storyguard? Auxier: Sophie Quire is a swashbuckling adventure about a girl who must hunt down and protect a set of mysterious books that can answer any question asked of them. I was a reluctant reader growing up, and wrote Sophie because it’s the book I wish someone had given me when I was that age. Also, it has a ton of monsters in it. Auxier: My favorite chapter might be “Highway Robbery” in which Sophie finds herself being kidnapped in a carriage on a moonlit road—only to have a highwayman show up and kidnap her again. Needless to say, things do not turn out as planned for said highwayman! The review copies was kindly sent by the publisher, Abrams. If you make a purchase using the Amazon links on this site, a small portion goes to Great Kid Books. Thank you for your support.